Well. It’s been so long I almost forgot how to log into my own blog! I’ve missed blogging about quilting, so I’m glad things have slowed down a bit now that school’s back in session so I can get back here. The end of the school year last spring seemed crazy, and then we had an unfortunate basement flooding incident, which was a problem all summer and necessitated digging up the front lawn with an excavator (and is only now finally being fixed). Our flooding was minor compared to what people are experiencing in Texas and Florida, so it’s hard to complain, but it has been a nuisance, and a big unexpected expense. Anyway. I have snuck in a bit of sewing here and there, and I even have one to show you today! I’m always excited when I receive an unexpected package from Windham, and recently I found one on my doorstep containing Heather Ross’s upcoming line, Kinder. I always love Heather’s designs, and couldn’t wait to sew something with this new line. 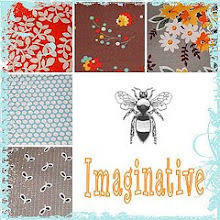 There are frogs and apples and flowers and a whole bunch of really beautiful colors which pair quite well with many of the prints from her previous lines, particularly Briar Rose. Fortunately I had saved (ahem, hoarded) a bunch of those prints so I decided to add them to this quilt. Thank you again to Windham for the fun fabric surprise! Kinder will be available in stores in February. 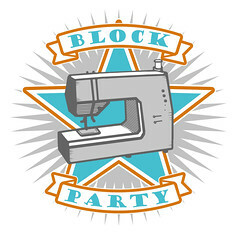 This entry was posted in Fabric, Posts about Quilts and tagged Heather Ross, hsts, kinder, kinder fabric, quilt top. Bookmark the permalink. Great seeing you back with another beautiful quilt! So happy that you’re back, and to know that all is well. 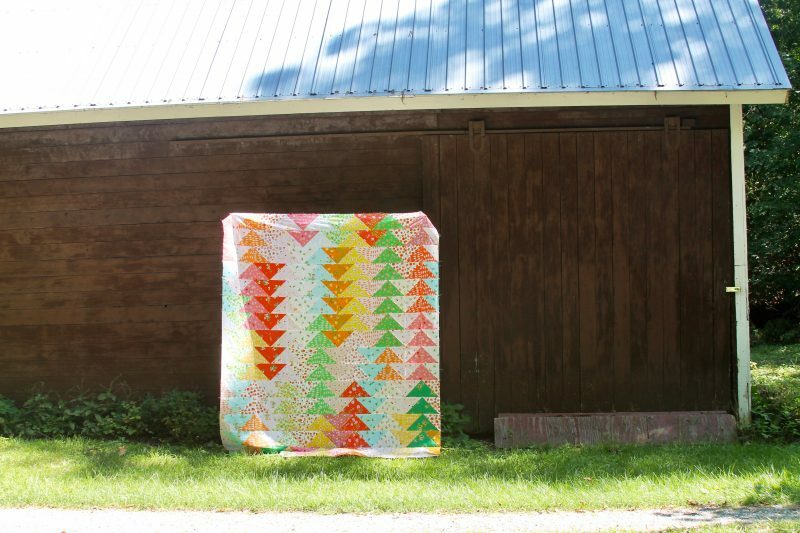 I always look forward to seeing your quilts! 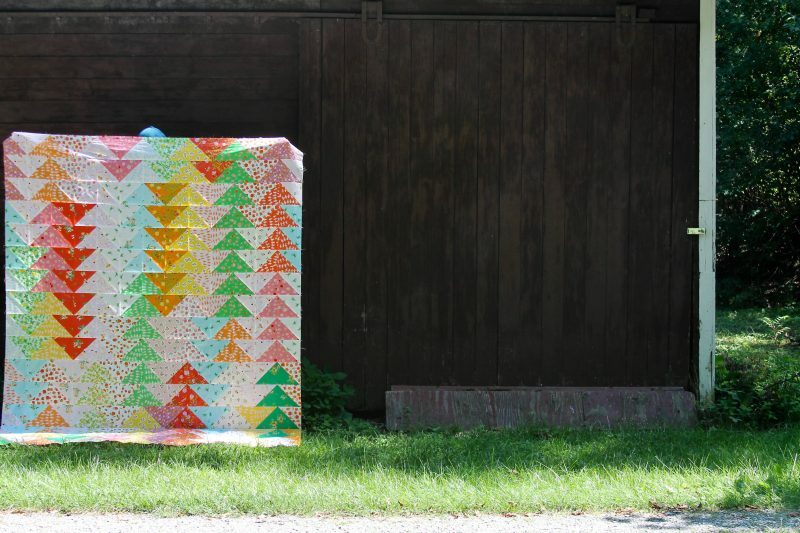 I love the quilt, and I’m so glad you are back to blogging. You’ve been missed! Love that you are back. Sorry about your basement, hope it gets done in a great and expedient way. 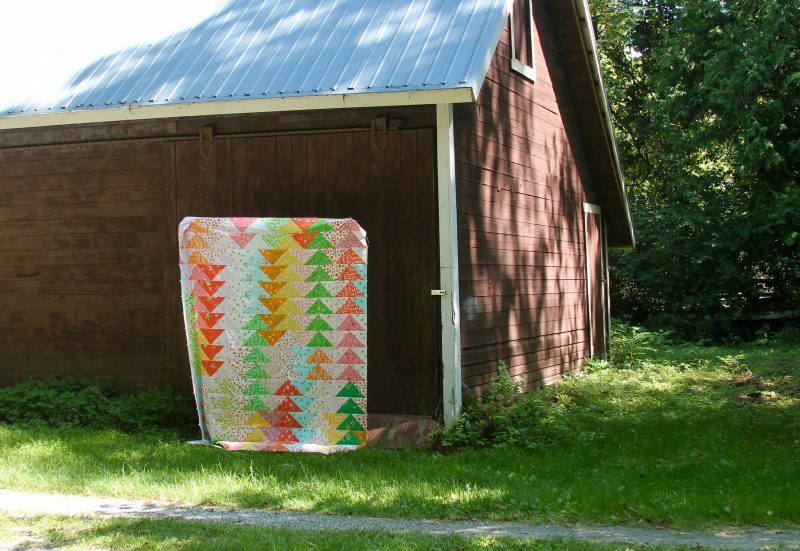 What is not to love about beautiful fabric and triangles photographed on a barn? Great job. It HAS been a long while! Glad you’re back, and brought a lovely quilt with you! I’m so glad to see you back! Lovely quilt! Glad you’re back with another amazing quilt! Welcome back! Love the quilt! I look forward to seeing more of your great quilting projects now that school’s back in session! Great to see you back along with another beautiful quilt. So sorry to hear about your basement flooding and other associated headaches and expenses. Having lived through that with little ones, memories returned of those tough days. Hope the worst is behind and you get some time for yourself. Glad you are back. Missed your quilts. P.S. : Please update your favorites. Thanks. Welcome back!! This is just gorgeous! 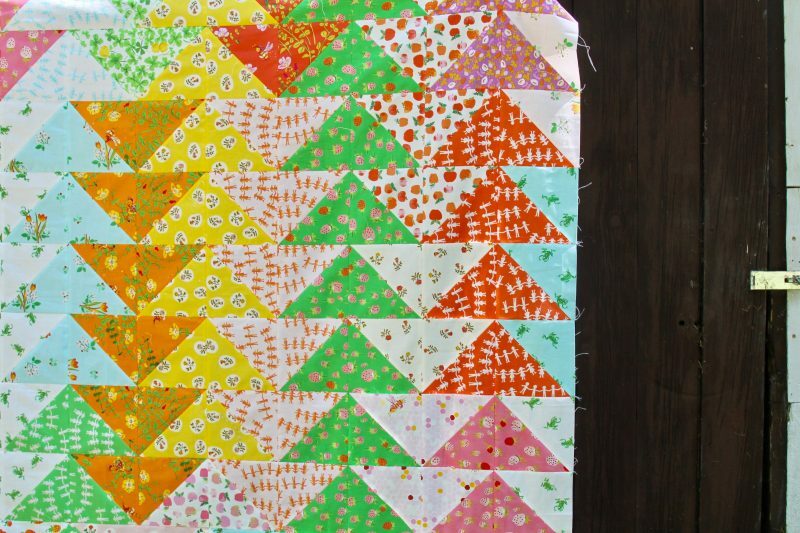 Those half square triangles are so pretty- I love the happy bright colors!! Glad to see you back. Sorry to hear it was a rough summer. I love the triangles. How did you figure out how to get the ‘arrows’ to run both ways consistently? Did you have to lay it all out before you started the half square triangles? I am so glad I am not the only one to have a plan in mind, but after cutting all the pieces, my mind says oops, lets do this instead. Great job!!!!!!!!!!! 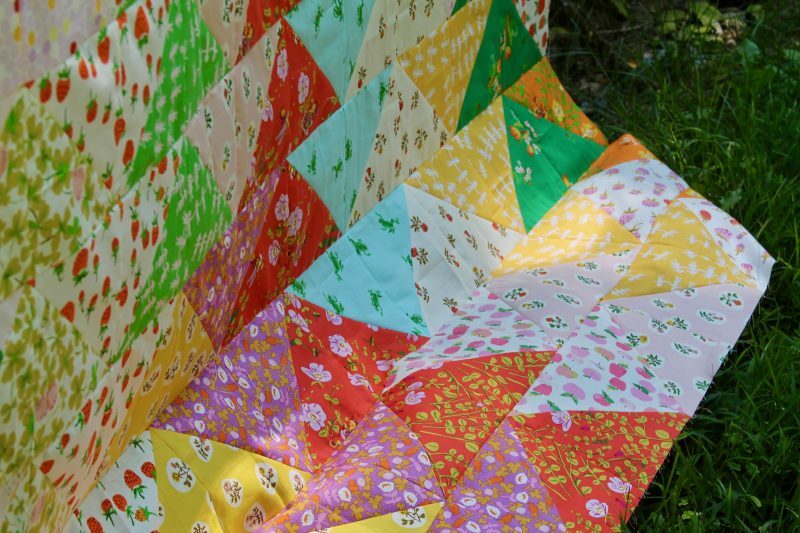 Simple pattern + beautiful fabrics = great quilts!